Outdoor Artificial Palm Tree – Make Your Garden Feel Alive! We’ve conducted a thorough examination of several imitation outdoor palm trees available online. We’ve found that the best outdoor artificial palm tree is the Vogue Plants Quality Artificial Peruvian Palm Tree. It looks realistic, provides some real “Wow” factor with its height of 8 feet, and is sturdy enough to hang decor elements from. For more information, see the Product Reviews section below. Our runner-up choice is the AMERIQUE AMZ5660-1 Unique & Gorgeous Tropical Monstera Palm Artificial Tree. This plant has some unique looks, a natural quality, and will look great among the other plants. It’s not the classic palm tree look, but it does add visual interest and a more horizontal spread than our top pick. Not your usual palm tree, but still a great looking plant. For details on the Amerique, see below. For those keeping the budget tight, the Youz Artificial Palm Plant for Office House Decor is worth checking out. This palm tree is a generous size, can be placed into your own pot for even more height, and looks full and lifelike. It doesn’t come with a pot, but does stand well on its own with a weighted bottom. It gives good looks for a good price. 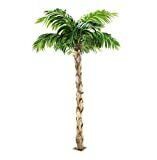 For further details on this cheap artificial palm tree, see the Product Reviews are below. Some of the major features that are important to consider are size, weight, sturdiness, and overall visual impact. Looks are important, as well as how easy it is to relocate the whole plant, as needed. Size is an easy one to focus on, as if your tree is too large or too small, it becomes clear that it is artificial, and no one wants that! Pick up a palm that fits your current size needs, and also doesn’t feel too small or large compared to your other existing plants. Some of the plants on our list include plastic pots, though frankly it’s probably best to replant the palms either in the ground, or in a larger ceramic or terra-cotta pot. A larger pot will give more balance to the plant, and will also give a much stronger impression that the plant is real. The good news is that you won’t need to water this plant, so you can choose a pot that doesn’t have ideal drainage and work with that. Some of the plants on our list have plastic trunks, while others have real wooden trunks. A wooden trunk makes the plant feel much more realistic than a plastic trunk because, well, the wood is real! However, you’ll probably want to take a wooden-trunked plant indoors when the winter comes. The leaves of a palm tree are almost always made of a plastic, or “silk” material. These have varying degrees of quality, but you want to be sure that the leaves are UV-resistant if the plant is going to be stationed outside for a significant portion of the year. Generally when you receive your palm tree, it will be all bunched up as tightly as possible for shipping. You’ll have to work the leaves and arrange the plant as best you can to make the tree look as realistic as possible. Carefully open the plant, and try to give each leaf a natural lilt. You may also need to adjust the individual leaves themselves, as well. Palm trees are icons. Is there anything that says “Tropical” louder than a palm? It’s possible to make anyplace feel a little warmer and more stylish with the addition of these green classics. They’re the heavy hitters of beach house decor, weekend getaways, and Florida rooms, and even those greenery-filled modern farmhouses all over Instagram and Pinterest. Palm Trees can, unfortunately, be hard to grow, hard to maintain, and hard to find in a size that will complement your existing features, such as an inflatable hot tub. Or, if you’re strictly a seasonal backyard user, it’s a bit wasteful to stock up on potted palms at the beginning of the summer – only to sacrifice them to the first winter freeze. Artificial Palm Trees to the rescue! If you haven’t shopped for one before, you may be pleasantly surprised at how lifelike they’ve become. In this section, we look at five of the best imitation palm trees available. We’ll start with a comparison table to get the lay of the land, and then move into individual reviews. We’ll conclude with our favorites. Tree only – no pot. The Youz palm tree has a natural look that will look great mixed in with real plants. Based on the popular parlor palm tree types, it has three trunks that rise from a suitably gnarly and woody-looking base. The realism is quite convincing. We find the details of the trunk to be good – there is variation in the color, from yellow to green, there are lighter green “new” leaves, and there are convincing growth scars on the stems. Unlike some of the other palms we reviewed, this is a plastic trunk. Generally, buyers feel that this doesn’t present a problem in how natural the Youz palm looks, but there were some comments that indicated that they felt the finish looked too shiny. The whole plant is relatively lightweight, which may need some special consideration if it is placed in a windy area without special measures. It does come with a refillable weighted base, that comes from the factory already loaded with a sandy substance. This makes the plant weight in at about 5 lbs. It’s advisable to anchor it firmly in a pot for outside use, however. Some buyers have found that the base had a tendency to leak on arrival. There is a removable plug on the bottom, should you need to add additional sand to refill the base. This particular plant does not come with a pot. As it measures just over 5 feet without the pot, it could be made taller by placing into a planter, which is a nice feature. The trunk diameter is about 5”, so you’ll want at least a 16-24” pot. The Bottom Line: A Fake Palm Tree, Cheap! Overall, the Youz Artificial Palm provides a good sized palm plant – about 3 feet of horizontal coverage with the palm fronds fluffed out – easy assembly and portability, and a natural look. We rated it as our Budget Pick among our group. BEAUTIFUL AND TALL: Looking as close to reality as possible, this fake palm tree plant will impress your guests. It can be placed anywhere, just like real plant. The advantage is that it looks the same but you don't have to water it daily or to offer special attention. WORRY AND STRESS FREE UPKEEP: Never need water or sun. Basic assembly and shaping needed while openning the box when you receive.After that this artificial plant will maintain its height, color and shape for years without pruning and shaping to ensure the aesthetic is maintained. The Pure Garden Palm Tree looks like a variation of a typical Cat Palm, and has approximately 4 wooden trunks that extend from a single base. The base is mounted into a basic black plastic pot – 7” in diameter, nothing fancy. Unless your style veers towards the very minimal, you will want to place this inside another, more decorative planter. The main pot is filled with a cement that adds the stabilizing weight to this piece. The leaves on this one look a bit on the artificial side, and are particularly glossy. The wooden trunks are a bit flimsy for extended outdoor use. The Pure Garden feels a bit on the artificial side, as artificial plants go! Overall, the Pure Garden has a rather generic look — fine for dressing up a larger group of greenery, or filling in some empty spots, but not quite up to the rigors of close examination or being a centerpiece plant. It has a spread of about 30 inches, and will need to be “fluffed” out upon arrival, as it is shipped with the leaves pressed up. The whole plant is middle-of-the-road offering – nothing extraordinary, and just about what you’ve seen with other artificial palms. It’s adequate, but there are others in our group that offered a bit more realism and variety for the same price range. EASY CARE- This artificial palm tree is great for busy folks who want a bit of greenery in their garden or home, but don't have the time to care for living plants. The leaves wipe clean with a soft damp cloth, and the plant never requires watering. REALISTIC DESIGN- Either up close or at a distance, this faux plant will reinvigorate the landscaping of your lawn or garden and bring a fresh look to your indoor décor. The trunk is natural wood and the leaves are brightly colored for a life-like look. FORM AND FUNCTION- The 5-foot height of this tree can add an element of privacy to your outdoor spaces. Use it to screen your pool, patio or deck from curious eyes so you and your family and friends can enjoy your mini oasis in peace. WEATHER RESISTANT- The UV resistant PVC leaves will remain bright and vivid in the sun and elements to give a lasting beauty to your lawn, garden or home. The pot is weighted enough to withstand wind while still being easy enough to move around. PRODUCT DETAILS- Natural Trunk with UV Resistant PVC Leaves. Pot Dimensions: 7" Diameter. Tree Dimensions: 60" H x 30" W x 30" Deep. For those needing a sturdier, realistic, classic palm tree, the Vogue Plants Peruvian Palm delivers. 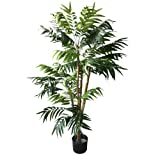 This is a tall, eye-catching palm that will need some extra support to stay firmly upright. It has an 8″ x 8” square metal base that can be fastened down, if necessary, using the openings drilled into the base for screws or bolts. You can put it in a pot, or in the ground. 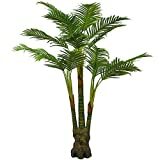 The fronds are realistic, come in multiple shades for a more authentic look, and provide a nice canopy – the total horizontal reach is over 6 feet. The construction is strong enough to allow for hanging ornaments or lights from the leaves – none of our other palm trees that we reviewed were suitable for this. Sturdiness is another desirable feature – the trunk is actually solid wood, with a real palm texture overlay. The attention to detail is evident at the top, which includes authentic-looking fiber that nicely covers the attachments for the fronds. When delivered, the tree comes in sections. There is a lower trunk piece with the metal base already attached. The upper trunk is connected to the lower with two metal rods. The fronds are not attached initially, and will have to be inserted into the top of the tree individually. There are different sizes and shades to add realism, and they create a nice full canopy effect when they are all inserted. Some buyers find that they didn’t receive instructions in the box. Should you not receive any information inside the package, be sure to reach out to the seller and they’ll email over instructions. Overall durability on the Vogue Plants palm seems to be quite good. That said, you should probably bring in the tree during the winter months, to prevent any damage to the wooden trunk unless you’re in a particularly calm location. This is a well-made tree with a convincingly natural appearance, and is the best artificial palm tree available. This replica tree has a Height of : 240cm (includes foliage) Tree is supplied with a steel base, which can be inserted into a planter, or screwed to the floor. This palm tree is easy to assemble, with the trunk supplied in 2 sections and the foliage clipping into the head of the tree. This palm tree is easy to assemble, with the trunk supplied in 2 sections and the foliage clipping into the head of the tree. This Croton palm tree from Silk Tree Warehouse is on the small side, but still provides a big punch of tropical color when you need it! Fresh out of the box, the appearance of this plant is very convincing, representing the bright colors of Croton plant foliage accurately. Made of a synthetic rubber, the plant has a sturdiness that was mentioned by more than one buyer. The leaves are UV resistant, and the manufacturer states that they can handle the sun and other conditions without fading. That said, some buyers found that the UV-resistance of this plant is not ideal. Some found that the leaves were bleached white in a matter of days, while others found that the leaves stayed colorful and vibrant even in bright sun. Should you choose to pick one of these up, you may want to get a UV-protecting spray as an additional protection, and keep a close eye on the plant for fading. The width of the plant, once “fluffed” is about 1.5 – 2 feet. This is a popular plant for use as a houseplant and landscape plant in warm climates, and buyers commented that the artificial version fit in very well with existing plants. The weighted black plastic pot is basic, and should probably be replaced with a nicer pot as soon as possible. As the whole, plant and pot measure about 3 feet tall. There’s not a huge risk of the piece being top-heavy or prone to tipping. The Silk Tree Warehouse Croton palm arrives in one piece, with no assembly required, other than a little bit of fluffing and arranging of the leaves. It’s a very nice-looking plant, colorful and well-made, but with a price point that is over some of the larger palm trees we’ve reviewed. And watch out on the UV Coating. Amerique’s Monstera Palm plant has a very natural look and a uniqueness that makes it stand out among your other pieces of tropical decor. It has a height of over 5 feet and great sturdiness. Monstera plants are experiencing a lot of popularity right now, and Amerique’s version is a good representation of a healthy specimen. The plastic trunk is convincingly textured and realistic, with variations of color that make it look quite authentic. The silk leaves are nicely detailed, with everything from unopened fronds to varying shades and sizes of mature foliage. Features like aerial roots and a gnarly base make this Monstera look just imperfect enough to pass as real. The 8” black plastic pot is included, and it’s almost certain that you’ll want to place it inside a larger planter. It’s not offensive, but the size just doesn’t look right with the overall plant. The Amerique Monstera Palm arrives in one piece, and will need some rearrangement of the leaves upon arrival. Otherwise, this plant should not need any special preparation – other than placing it inside another planter, as mentioned. For general impact, this plant is terrific. Not only does it have a nice height, it also has a horizontal spread of 40 inches. It will help fill in some territory in your outdoor space, while standing up to the elements with UV resistance. The Amerique Monstera is our runner-up choice among artificial palms, and is an excellent option. Picking out an artificial palm tree for your outdoor space can be difficult – it’s a classic style, and there are a number of choices out there, in all price ranges. With outdoor use, we suggest that you focus on material durability, overall visual impact, and the size of the plant. We prefer a larger, realistic plant that doesn’t tip or fade in the sunlight. Our Top Choice product, the Vogue Plants Quality Artificial Peruvian Palm Tree, is a 8-foot tall plant that looks convincing and not at all fake. It has solid construction that will hold up to wind and weather. Our Runner Up choice, the Amerique Tropical Monstera Palm Artificial Tree, is a very natural looking plant that will almost convince you to water it – but don’t. Our Budget Pick, the Youz Artificial Palm Plant for Office House Decor, combines a nice size, realistic-looking trunk and leaf features, and a price that will help you add tropical touches all around your outdoor living area.